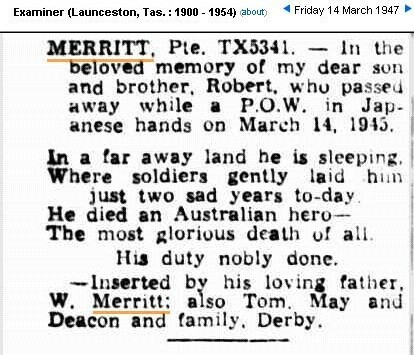 Background : Son of William Henry and Clara Ann Merritt, of Derby, Tasmania, Australia. Presumably executed for attempted escape. How he got to Ubon is unknown. 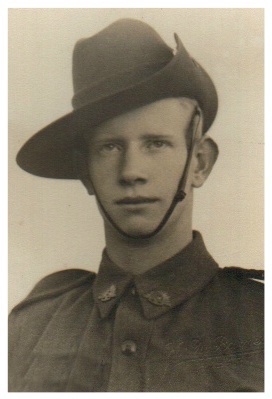 29/04/1941 Enlisted for war service Brighton, Tasmania. 30/04/1941 Allotted to Australian Imperial Forces Reinforcements. 30/04/1941 Taken on strength from Recruit Reception Depot. 30/04/1941 Granted pre embarkation leave 30/04/1941 to 06/05/1941. 15/05/1941 Marched out Brighton 6 Military District (Tasmania) to 3 Military District (Victoria) via Burnie, Tasmania. 16/05/1941 Marched in 2 Training Battalion from 6 Military District (Tasmania). 24/05/1941 Transferred 2 Training Battalion to 2/40 Battalion Reinforcements Alice Springs. 01/06/1941 Marched into 7 Military District (Northern Territory) from 3 Military District (Victoria). 07/07/1941 Admitted 119 Australian General Hospital 7 Military District (Northern Territory) with foreign body in eye. Posted to X list. 15/07/1941 Discharged 119 Australian General Hospital and struck off X list. 16/08/1941 Transferred from Camp Hospital and discharged to 119 Australian General Hospital. 20/08/1941 Admitted to 111 Convalescent Depot and posted to X list. 25/08/1941 Discharged from 111 Convalescent Depot and struck off X list. 02/10/1941 Marched out from 7 Military District (Northern Territory) to 3 Military District (Victoria). 10/10/1941 Marched into 2 Training Battalion 3 Military District (Victoria) from 2/40 Battalion 7 Military District (Northern Territory). 28/10/1941 Posted to 12 Reinforcements 2/6 Battalion. 30/10/1941 Deleted from boat roll. 30/10/1941 Transferred to Engineering Training Depot from 2 Training Battalion. 31/10/1941 Posted to Reinforcements 2/2 Pioneer Battalion from Engineering Training Depot. 02/11/1941 Embarked at Sydney, New South Wales for service overseas. 27/01/1942 Marched out to 2/2 Pioneer Battalion. 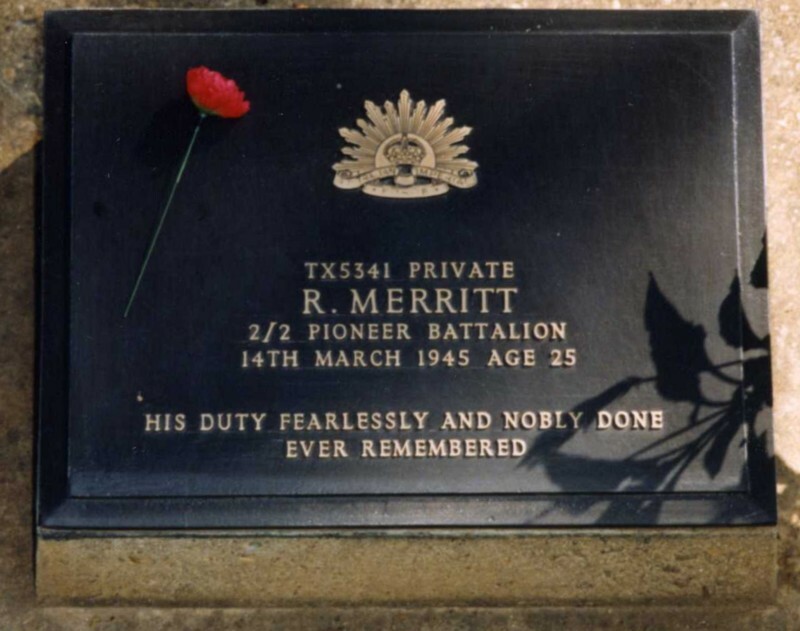 27/01/1942 Taken on strength 2/2 Australian Pioneer Battalion from Australian Pioneer Training Battalion. 25/05/1942 Presumed missing in action 07/03/1942. 05/10/1942 Reported missing in action believed prisoner of war (Tokyo Radio). 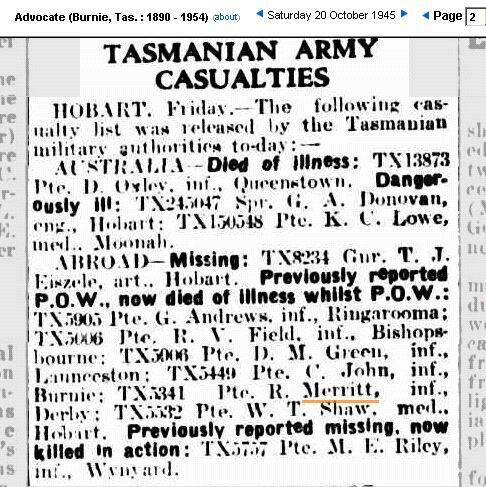 16/10/1942 Reported missing in action believed prisoner of war. 30/07/1943 Reported prisoner of war, Java. 05/08/1943 Previously reported missing in action believed prisoner of war now reported prisoner of war interned Java camp. 14/03/1945 Died whilst prisoner of war (shot by Imperial Japanese Army) location not stated.